The law at the center of the case is Senate Bill 8, passed in 2017, which requires the burial or cremation of fetal remains. “It’s a tough case for everybody,” U.S. District Judge David Alan Ezra said Friday during a pretrial hearing. In January he granted an injunction blocking a state fetal remains burial rule, but he said last week that the previous decision is no indication of how he would rule in the trial. The law at the center of the case is Senate Bill 8, passed in 2017, which requires the burial or cremation of fetal remains. That followed a ruling that year by U.S. District Judge Sam Sparks that struck down a similar rule implemented by the Texas Department of State Health Services. Sparks said that rule was vague, caused undue burden on women and had high potential for irreparable harm. SB 8 was slated to go into effect Feb. 1 and force health care facilities to bury or cremate any fetal remains from abortions, miscarriages or treatments for ectopic pregnancy, regardless of their patients’ personal wishes or beliefs. The Center for Reproductive Rights and Whole Woman’s Health sued the state over that part of SB 8 and won the temporary injunction. During the multi-day court hearing at the time, state attorneys said the rule was designed to provide aborted or miscarried fetuses a better resting place than a landfill. They also argued that there would be no cost for patients to worry about and only small costs for providers. The state also said that there were multiple groups willing to help with costs. John Seago, legislative director for Texas Right to Life, an anti-abortion group, said after Friday’s pretrial hearing that his organization was watching the case as it’s “important to the state’s ethic” when it comes to abortion issues. “This legislation was not a priority for us, but it is right for the attorney general to take it so seriously and to defend the state’s right to acknowledge that these victims of abortion deserve dignity,” Seago said. 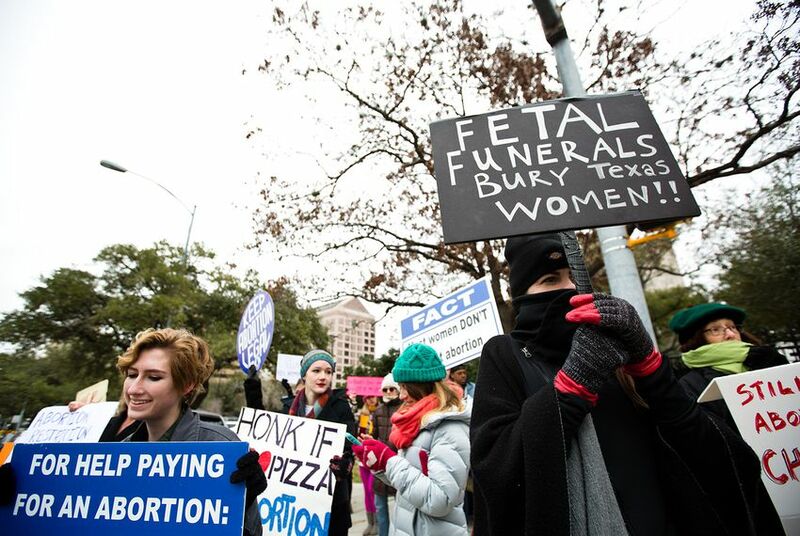 Ezra listened as both sets of attorneys spent nearly two hours going over logistics of the trial and other issues, including whether certain witnesses would be allowed to testify about the emotional trauma of abortions and fetal remain burials and keeping information about vendors confidential for safety reasons. Throughout Friday’s pretrial hearing, Ezra laid out what was on the court’s mind about the case, including: whether women may face an undue burden if there aren’t enough providers or facilities statewide; the logistics of how doctors and clinics would deal with the law if it went into effect; and if Texas has enough facilities available statewide to help dispose of the fetal remains. The trial also comes a week after President Donald Trump nominated D.C. Court of Appeals Judge Brett Kavanaugh for the U.S. Supreme Court. If confirmed by the U.S. Senate, Kavanaugh would replace Justice Anthony Kennedy, who announced his retirement this month. The prospect of Trump appointing a second Supreme Court justice has fueled speculation about the the future of abortion policy, including the potential overturning of Roe v. Wade. Ezra touched on the Supreme Court issue, saying that the high court could eventually have an impact on the case at hand — but there was no room to speculate right now. “It’s very ironic, but we have to proceed today on what the law is today, and I’m bound by what the law is today,” Ezra said.